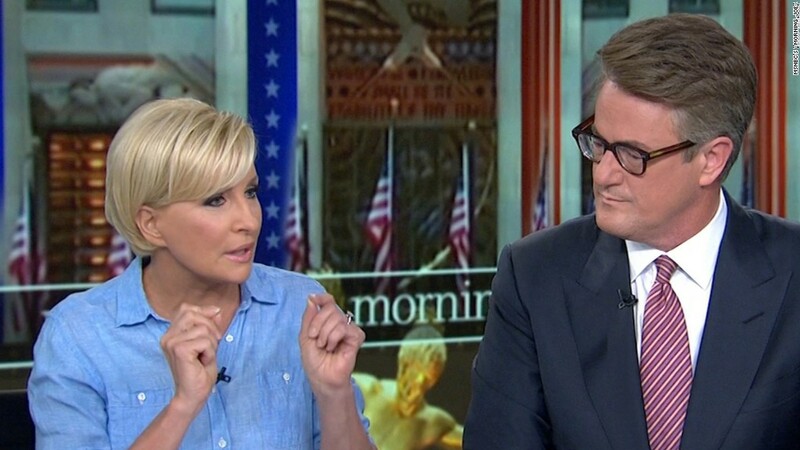 One day after being attacked by President Trump, Mika Brzezinski and Joe Scarborough are trying to turn the national conversation around, making it about the president's "erratic behavior" and his emotional health. "We're OK. The country is not," Scarborough said on Friday's "Morning Joe" on MSNBC. Brzezinski said Trump's behavior was "frightening and really sad for our country." Scarborough said the president has a "disturbing obsession with Mika." One of their guests, advertising executive Donny Deutsch, said the president is "not of sound mind." Summing up the tone of the discussion, Brzezinski said, "I'm really worried." The co-hosts also made a stunning allegation -- that Trump and his White House used the possibility of a hit piece in the National Enquirer to threaten them. Trump called the claim "fake news" in a tweet, leading Scarborough to reply that he has proof -- "I have texts from your top aides and phone records." At the same time, on other networks, Trump aides blamed Scarborough and Brzezinski for exhibiting what they said was anti-Trump bias and animosity. "I endorse the president's right to fight back" when "the airwaves are filled with raw sewage about him and his fitness for office," counselor to the president Kellyanne Conway said on "GMA." "Morning Joe" hosts and guests have repeatedly raised questions about the president's mental state and his fitness for the job. Brzezinski and Scarborough returned to that theme on Friday with a Washington Post column titled "Donald Trump is not well." "President Trump launched personal attacks against us Thursday, but our concerns about his unmoored behavior go far beyond the personal," the pair wrote in the column. "America's leaders and allies are asking themselves yet again whether this man is fit to be president. We have our doubts, but we are both certain that the man is not mentally equipped to continue watching our show, 'Morning Joe.'" Brzezinski and Scarborough quipped that Trump should exclusively watch the pro-Trump morning show "Fox & Friends." Observers speculated that the president's nasty tweets on Thursday morning were a reaction to Brzezinski and Scarborough's intense criticism of him. On Friday, Brzezinski brought up the same thing. She said she wondered, when she criticized the president in personal terms on Thursday, if he'd respond. "It's unbelievably alarming that this president is so easily played," she said. "He's so easily played -- by a cable news host! What is this saying to our allies? What is this saying to our enemies?" In the Washington Post column, she and Scarborough asserted that "the president's unhealthy obsession with 'Morning Joe' does not serve the best interests of either his mental state or the country he runs." They also said they have "noticed a change in his behavior over the past few years." Scarborough usually writes a Friday column for the Post. With Trump's tweets taking over the news cycle on Thursday, he decided to co-author it with Brzezinski, his fiancee and co-host. The pair made the point that Trump's insults were not only offensive, they were factually inaccurate. Trump said the pair "came to Mar-a-Lago 3 nights in a row around New Year's Eve, and insisted on joining me." "That is false," Brzezinski and Scarborough said in Friday's column. Trump also said "she was bleeding badly from a face-lift. I said no!" Photos of Brzezinski at Mar-a-Lago contradict this. "Putting aside Mr. Trump's never-ending obsession with women's blood, Mika and her face were perfectly intact, as pictures from that night reveal," they said in the column. "And though it is no one's business, the president's petulant personal attack against yet another woman's looks compels us to report that Mika has never had a face-lift. If she had, it would be evident to anyone watching 'Morning Joe' on their high-definition TV. She did have a little skin under her chin tweaked, but this was hardly a state secret. Her mother suggested she do so, and all those around her were aware of this mundane fact." With regard to the New Year's Eve visit, which was reported at the time, Brzezinski and Scarborough asserted that Trump was actually wooing them, trying to get the hosts to come visit him, not the other way around.